"I have not had an abortion. 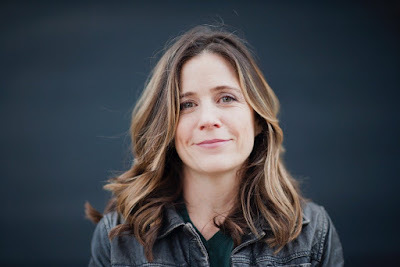 I'll put that right out there," documentarian Tracy Droz Tragos tells me as we sit down in LA to talk about her film Abortion: Stories Women Tell, which hits theaters this week. "But it's not like this subject is not personal for me." In fact, the subject quite literally hits close to home. Tragos's home state of Missouri, where she shot the film over the span of more than a year, has some of the country's most restritive abortion laws on its books. But her film is about people — not just policies. All told, Tragos interviewed more than 40 women who have been touched by abortion in myriad ways. There's Amie, a single mother of two who works 70-90 hours per week and finds herself unexpectedly pregnant. 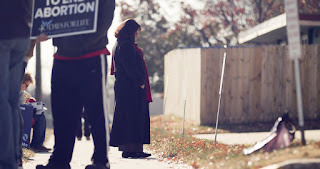 There's Kathy, an antiabortion Catholic activist who pickets Planned Parenthood and is sometimes brought to tears just talking about her cause. There's Chelsea, a devout Christian who made the difficult choice to terminate her pregnancy after learning her fetus had a fatal neural-tube defect. While few women speak openly or publicly about their experiences with abortion, statistics show that three in ten abortion women we undergo the test by the time they are 45. Tragos's Missouri upbringing would prove to be key when it came to uncovering these rarely heard stories. She met Dr. Erin King of abortion provider Hope Clinic through a friend of a friend and, via that connection, earned the trust of dozens of women who opened up to her on camera. (While Hope Clinic is located in Illinois, it's just a short drive from the Missouri border and treats many women from the neighboring state.) The resulting film makes a compelling case that women's reproductive rights are eroding not only in states like Missouri but across the country, and that we can't afford to be complacent about it. Read on for more of our interview with the filmmaker, and visit Abortion: Women Stories to find a showing near you. Daily Style Entertainment: I was really moved by how many women opened up to you about an issue and experience that is so personal and controversial. Was there a domino effect where one woman met you and trusted you and so on? Daily Style Entertainment: Once you spoke with these women, what about their experiences shocked you or struck you the most? Daily Style Entertainment: You do interview several antiabortion activists in the film. Were they happy with how they were portrayed? Daily Style Entertai8nment: One antiabortion activist you interview had, herself, had several abortions. Her message was that every woman who had an abortion would feel shame, and instead of questioning where the shame came from, it was: "I felt this way after an abortion, so therefore abortion is bad." What do you think her view says about the antichoice attitude? Daily Stle Entertainment: Have you kept in touch with some of the women you met? I'm especially interested to know where Amie, who in some ways is the anchor of the film, is today. Daily Style Entertainment: Another story that I think will stick with people is a woman who was very excited to be pregnant but learned that the fetus was not viable. She was then subject to this 72-hour wait period and had to live with that knowledge for three days. The nuance in her experience was something you don't hear lawmakers discuss when they're bickering about abortion. PS: The new Supreme Court abortion decision effectively strikes down many of these laws in many states. Why do you feel this film is still relevant and important despite that win for abortion rights? PS: This is coming out at a very pivotal time politically. Was that something that strategically you thought about as you set a release date? TDT: Certainly, we were aware that the election was coming up, but this film was never meant to be an advocacy piece. I hope it has some power or lingering impact because of the personal perspective and because of the choices we've made to keep it from being a political film. Nonetheless, you can't really separate it, especially right now in these times. It can have some measure of impact. I know who I'm rooting for, and it's not Donald Trump.